The Common Frog, also known as European Common Brown Frog, is an amphibian that belongs to the genus of Rana. These frogs are found in major parts of Europe and Arctic Circle. These amphibians are more prone to jumping, instead of walking and can live up to 8 years. They are majorly categorized into three sub groups- R.t. temporaria, R.t. honnorati and R.t. parvipalmata. Common Frogs has certain descriptive features that worth a special mention. Color : The color of this amphibian varies from brown to yellow. The backs and flanks of these frogs have an olive green lining and are covered with asymmetrical dark marks. In some parts of the world, atypical combination of black and red colored frogs are visible. With a dark spot behind the eyes, these amphibians turn grayish blue during their mating season. Red eyes and yellow skin, possessed by the albino Common Frogs, distinguish them from their kind. The back of the neck bears a chevron-shaped spot and have either white or yellow underbellies. Female Common Frogs have orange underbodies and brown eyes. Length : The average length of these frogs ranges in between 6-9 centimeters. Short posterior legs and webbed feet classify these sorts of amphibians in the group. Weight : The average weight of these amphibians is 22.7g. Height : Male Frog is shorter than the females. Ear Drum : These amphibians have a clear distinct tympanum. Glands : Common Frogs have a slightly raised paratoid glands. Tongue : These frogs use their gluey tongue to catch prey. Legs : Common Frogs are equipped with long legs to jump great heights. Teeth : These frogs possess small fish like teeth to eat their prey. Common Frog is found throughout Europe and in the Scandinavian region. Other areas that come under their distributional zone are Isle of Lewis, Shetland, Ireland, Orkney and the Faroe Islands. These amphibians are also found in Hungary, Italy, Liechtenstein, Luxembourg, Republic of Macedonia, Albania, Andorra, Austria, Belarus, Belgium, Bulgaria, Croatia, Czech Republic, Denmark, Finland, France, Germany, Greece, Serbia, Slovakia, Slovenia, Spain, Montenegro, Netherlands, Norway, Poland, Romania, San Marino, Scotland, Sweden, Switzerland and the United Kingdom. Outside the breeding season, this species live a lonesome life in the damp places near the gardens, woodland and meadows. 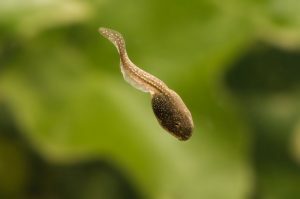 It prefers to live on land when it is not breeding. Common frogs breed in puddles, ponds, lakes and canals and are active throughout the year. They prefer to hibernate during the cold months. Some of the behavioral traits of this amphibian are noteworthy. Though they are usually active during day time, but prefer nights. 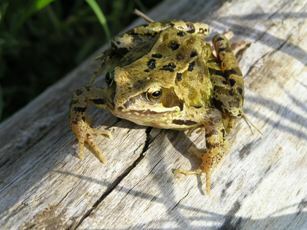 Common Frogs feed during the non-breeding season only. Old frogs feed on land, while the young ones prefer to feed inside water. These animals prefer shallow water ponds for breeding. Feeding on insects, worms, slugs and snails define the carnivorous nature of these amphibians. These frogs prefer to hibernate underwater, beneath piles of mud decaying leaves, stones and logs or under compost heaps. Common Frogs do not eat during the breeding season which generally commences from March. They eat only during the non-breeding period. 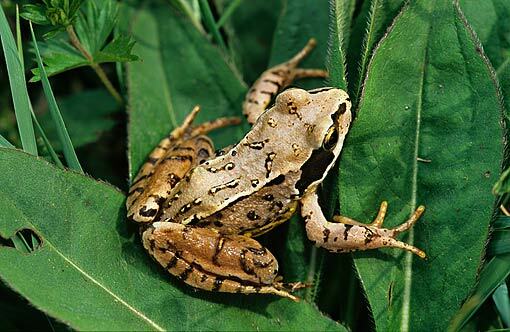 Common Frogs are predaceous in nature and prefer to eat living foods such as fruit flies and crickets. Houseflies, young mice, snails, slugs, insects and worms are also consumed by frogs with much delight. Common Frog larvae generally experience a threat from dragonfly larvae, birds, fish and beetles. Adult frogs are generally eaten by terns, herons, pine martens, stoats, weasels, crows, gulls, ducks, polecats, badgers and otters. Frogs experience life danger from domestic dogs and cats. Every year a large number of frogs are killed by motor cars and vehicles. Slugs poisoned by slug pellets are often eaten by these frogs and hence stand as one of the main factors for their extinction. Common frogs have certain adaptation qualities that need a special mention. · Common frogs can breathe through their skin which enables them to hibernate for the coming months under the decaying leaves water and mud piles. · Due to their transparent inner eye lids, these amphibians can protect their eyes under water. These amphibians have the ability to change their skin color according to the environment. Depending on the surrounding, Common frogs can breathe through their lungs. They are compatible to live under water and also above the surface. These frogs can absorb water through their skin hence they do not need to drink. 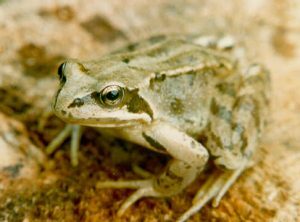 Commencing in March, Common Frogs live on land and breed in shallow areas. During breeding, frogs do prefer to eat. The adult frogs assemble in the ponds and look for female ones. A pitch-black swelling on the nuptial pad of the male frogs is visible during the mating season. The throats of the male frogs turn white during mating. Actual spawning takes place at night. The females are bigger than the males and lay around 1000 to 2000 eggs after breeding. Common Frogs can live up to 8 long years. Certain arrangements are needed to be taken care of to keep Common Frogs as pets. 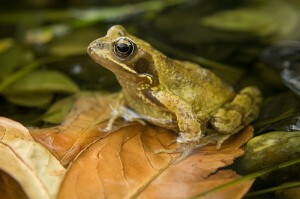 Housing- Common Frogs can adapt any situation and live a prolong life, if apposite care is taken. Proper tank has to be set up to enable the common frogs live comfortably. Feeding- They can be fed on insects, worms and snails. Care- Hygiene should be maintained where the frog will be kept. Faecal matter excreted should be cleaned once located. It is enrolled in IUCN Red list of Threatened Species as a species of Least Concern and is protected under the Wildlife and Countryside act 1981. Common Frogs have certain interesting facts that are worth mentioning. Common Frogs do not have any vocal sacs. They lack mid-dorsal gland unlike other amphibians. These frogs cannot survive in salty water. Common Frogs can jump great heights because of their structured legs. Frogs communicate with each other with the help of typical croaks. Common Frogs do not hibernate in a terrarium. Common Frog is considered as one of the distinct amphibian among the 4000 present in the world. These amphibians are adaptable to any situation, on land and in water, hence are available throughout the world. Find out how this slimy amphibian looks like.